Tommy Atkins mangoes were first cultivated and grown in Florida in the early 1920’s and were harvested for commercial export. This juicy fruit is oval and medium to large in size. It is yellowy-orange in colour with a deep red, purple hue. In 1910, a Captain named Haden grew the first seedling from a seedling he brought back when in Bombay, India. 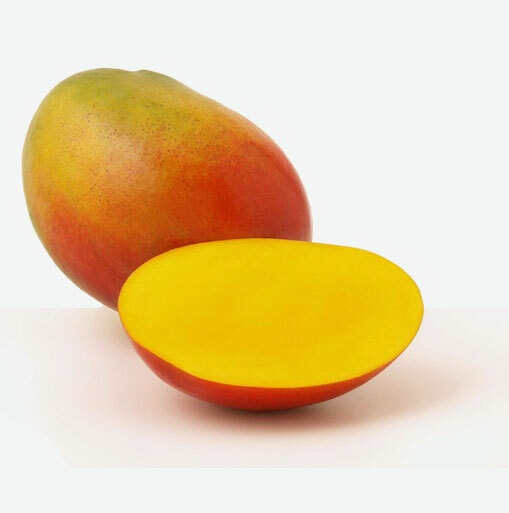 This mango became known as the Haden Mango. It has a yellow, orange-red colour and is mild flavoured and juicy. A Hayden mango can weigh anywhere from 16 to 24 ounces. The Keitt mango is believed to have originated in 1945. It is an Indian variety and is quite large in size. Keitt mangos can weigh 20 to 26 ounces, are oval in size with a tapering on one end that makes it look like it has a nose protruding from its tip. It is green to orange-yellow in colour when it is fully ripe. It has a firm flesh with a piney sweetness and is juicy. The Kent mango came to life in 1944. A large, oval shaped fruit weighing about 20 to 26 ounces. This mango is plump and is greenish yellow in colour with a bit of a red hue. It is one of the sweetest and richest of the mangos but it is also one of the softer mangos and should not be squeezed too hard. This tropical delicacy is very low in saturated fat, cholesterol and sodium. Mangos are a good source of dietary fiber and vitamin B6. Mangos also deliver a good dose of vitamin A and vitamin C.
Select mangoes that are yellow to orange in colour or ones that have a red hue when they are ripe. Do not pick the ones that are light green as they are not fully ripe. Look for mangos that are heavy for their size and yield slightly to gentle pressure. Mangos do not need refrigeration and should be consumed within a day or two of purchase.